This facility for children with special needs is overcrowded and poorly funded in the post-Soviet economy. Of the 152 children served here, a number are not orphans and their families are dysfunctional. The winter is harsh, and the temperature in the buildings does not go above 40 degrees. 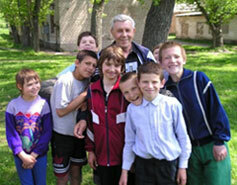 On his first visit, Mark Koehler, founder of Mission Ukraine Children’s Hope, noticed the vacant looks on the children’s faces. Many wore ill-fitting clothes that weren’t suitable for the weather. There were few toys and games. MUCH has provided hundreds of clothing items, including warm jackets and sweaters, shoes and boots, as well as a sound system, toys, sports equipment, two small washing machines and cleaning supplies. The children now have shoes and clothes that fit. But, they keep growing, and new children arrive. So, as in any family, it’s a constant challenge to keep them clothed. Because of the support of generous donors, MUCH has continued to provide the basic clothing needs for the children most in need for fourteen years. MUCH closed this program in September 2016 because the government improved its provisions for the children. The basic function of MUCH was no longer needed. 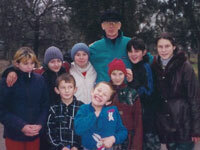 Read Letter of Appreciation from children of Marganets.